WordPress is labeled as one of the best CMSs for blogging. But since it’s launch, it has evolved to be capable of doing much more than that. Today it is looked upon as a complete website building platform. WordPress is capable of running a different kind of websites like eCommerce, online directories, consulting and corporate business sites, etc. WordPress is constantly modified and new updates are periodically released to make the CMSs more efficient. However, in this article we will talk about a WordPress updated that gained most attention – positive as well as critical. Experts cited this update as the biggest change in the history of WordPress. This new WordPress version is named after Johannes Gutenberg who revolutionized printing experience in Europe by introducing printing press. Similarly, WordPress Gutenberg introduces a new way to create and publish content through your WP websites. Gutenberg is the WordPress 5.0 update and it is by far the most debated updated. Since it changes the way content is created with WordPress, the announcement of a major change caused a stir in the WordPress community. What is different in this new updated version of WordPress, is the editor. What we made the WordPress community curious about this new update was the new editor that will change the way content is created through WordPress. The WordPress editor will be replaced by what is called the Gutenberg editor. The TinyMCE editor that we are using right now, will be removed and the Gutenberg editor will be your new default editor. This is a block-based editor that lets you create content by choosing the content blocks. The Gutenberg editor is not a page builder, but some of its functionalities are similar to it. We can expect more changes in WordPress with the later versions of WordPress Gutenberg, but for now, all we have to be prepared for is the WordPress Gutenberg editor and the block-based editing experience. WordPress 5.0 is supposed to introduce the new Gutenberg editor as the default editor. It will replace the tinyMCE editor with a new block based editor called the Gutenberg editor. This editor is developed with the aim to make content creation with WordPress more efficient. You can create flexible, multimedia rich content with the WordPress Gutenberg editor. The WordPress Gutenberg plugin is not yet totally ready. So it is available as a plugin for the users to try, but it’s recommended to only try it on test sites or local environment. You can download this plugin from the WordPress plugin repository and try WordPress Gutenberg editor for yourself. Here is a complete guide on WordPress Gutenberg editor. Gutenberg is yet to arrive and the WordPress enthusiasts have already started gearing up for this new method. Currently, the WordPress Gutenberg editor is not integrated as a default editor. Yet there are numerous addons for this plugin available to add more features to the Gutenberg editor. The Gutenberg editor is a block based editor. Everything can be managed through blocks. Use a text block for inserting textual content, there are numberous media blocks for video and image content, there are embed blocks to let you embed external content on your web page. The Gutenberg blocks really help create content more efficiently. Especially if you want to create pages/blogs with content variations. Even though the base blocks are enough to create any kind of content, more such blocks can be added over in form of addons. Here we have a list of all the Gutenberg plugins that are designed to enhance your editing experience in one way or another. The only thing that changes with WordPress 5.0 is the editor. Therefore, it is expected to be supported by existing themes and WordPress websites. However, the later version of WordPress Gutenberg may introduce new changes. The core changes in WordPress may require you to adjust your existing websites according to it. If you are using premium WordPress themes, you have nothing to worry about. The theme providers are already gearing up for WordPress Gutenberg. The premium themes are regularly updated to accommodate the changes brought about by new WordPress updates. So when core changes are introduced with the later versions of WordPress Gutenberg, the theme providers can just provide you with a theme update for the same. On the other hand, if you are about to start a new website with WordPress, and confused about the impact of Gutenberg you can use one of the WordPress Gutenberg themes. Here is a list of Gutenberg ready WordPress themes to get started with your new site. As I mentioned earlier, WordPress Gutenberg editor is a lot different than the classic editor we are using now. Button block: To insert buttons, etc. Each of these blocks have custom options, to make your text/media look and work the way you want. These blocks can be easily added, removed or rearranged, as and when required. Therefore, the WordPress Gutenberg editor with blocks will definitely provide you more flexibility. The Gutenberg editor is not exactly a page builder, but it has far more options and accessibility than the classic editor. The block based interface of the WordPress Gutenberg editor is also very intuitive. The ‘+’ button to add new block, the ‘^’ buttons to move the blocks up and down, etc. It is like a blank canvas where you can use combinations of different elements in form of blocks to create content of your choice. Here is a list of the best WordPress Gutenberg blocks to create amazing content efficiently with your new editor. Our WordPress Gutenberg edting blocks with custom features, Blocks Builder: Ultimate blocks for WordPress Gutenberg . These blocks include some ehanced text blocks, and some social icons related blocks. Since the announcement of the WordPress Gutenberg, there is a constant debate about it’s impact on various level of WordPress users & the existing websites. 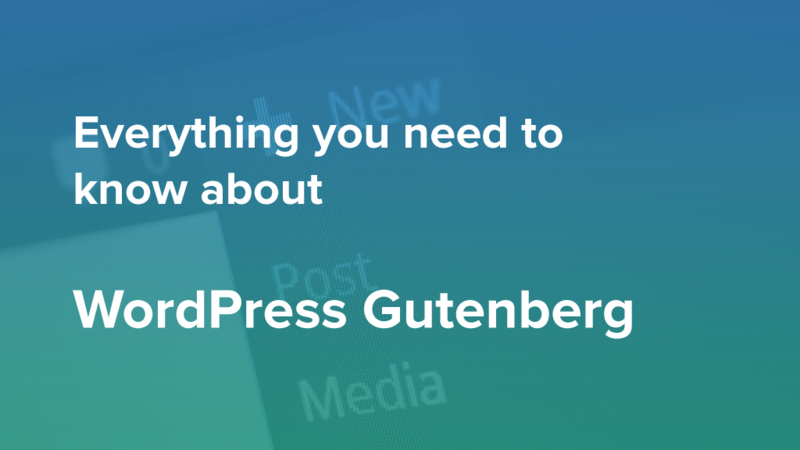 WordPress Gutenberg update is not just a simple WordPress update. Since it is the biggest change in the WordPress history, it is going to impact different level of WordPress users in different ways. One of the reasonable concerns of the WordPress users is the compatibility issue. Until WordPress Gutenberg is released, we can’t be sure of what it changes. However, the we can be sure that the changes will be introduces swiftly. Here’s a summary of the impact of WordPress Gutenberg on the WordPress world. What is the Gutenberg released? Gutenberg was scheduled to be released in the first half of 2018, but it’s been delayed. Ultimately it was released in January, 2019. Besides the new Gutenberg editor, what more changes are to be expected? For now, the only change to be expected is the replacement of the TinyMCE editor. Nothing else is expected to change with it. However, with the gradual updates, more changes may be introduced swiftly. Will my existing WordPress website break? What browsers will support Gutenberg? We can expect that WordPress Gutenberg will support all the browsers without problems. Can I merge and use two blocks together? Something like nested blocks? For now, there is no nested block, or any feature like that. But WordPress Gutenberg editor is not completely launch ready and there is a team working hard to make it more equipped. So we can surely expect that feature in future. Is it difficult to learn Gutenberg? Change is difficult, but it is inevitable. Software, applications and CMSs are only refurbished to make them better, add ease of use and improve their usability. One thing that we should never forget is that new upgrades and massive changes in software are always introduced for enhancing the software. The revamp can be about new features, a reformed user experience, or boosting the usability. Even though we too were a bit skeptic about this big change, WordPress Gutenberg is finally released and successfully running.